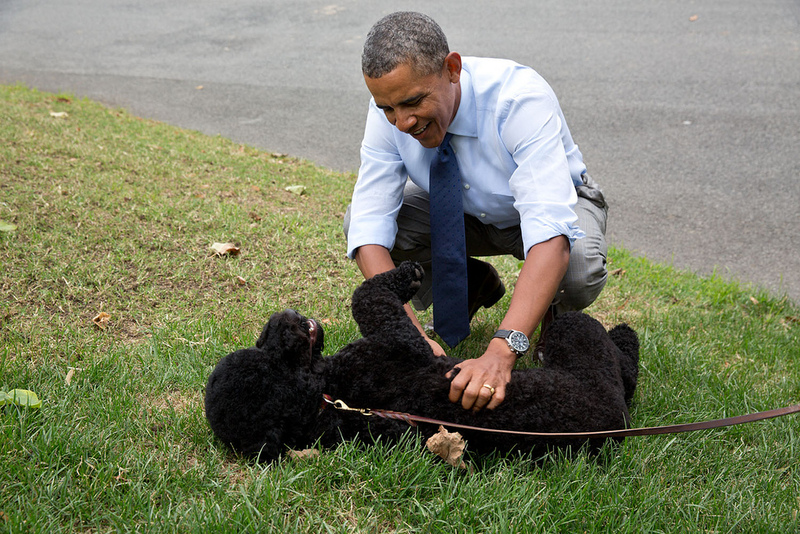 President Obama plays with Sunny on the South Lawn on her first day at the White House, Aug. 19, 2013. Like Bo Obama, Sunny is a Portuguese water dog. She was born June 11, 2012, and joined the Obamas on Aug. 19, 2013. Sunny’s origins remain somewhat of a mystery, with the First Family never officially confirming where they got her from. According to some accounts, Sunny originated with breeder Amy Durkin Lane of Allegiance PWDs in Attica, Michigan, due to the timing of a birth of puppies, a distinctive curly coat, and an identical puppy that was part of that litter. Durkin has declined to comment, so we can only speculate on Sunny’s origins. One thing’s for sure: Sunny is well loved by the First Family. 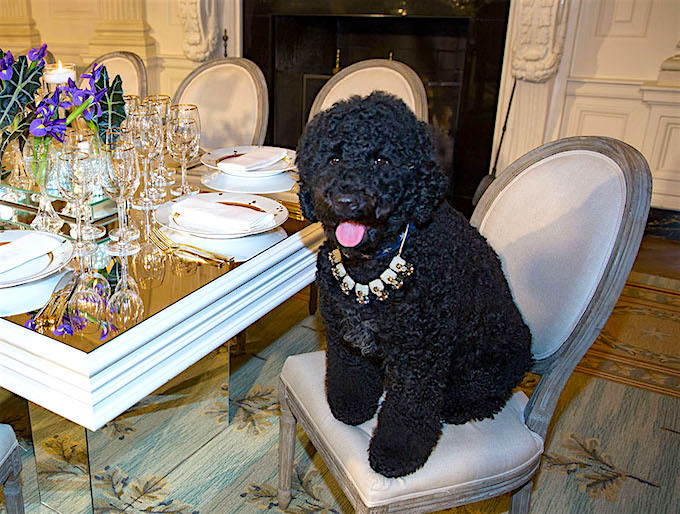 Sunny sits at a table in the State Dining Room of the White House, Feb. 10, 2014. The table settings were used at a State Dinner for President François Hollande of France. The Obamas decided to get Sunny to be a companion to Bo. According to President Obama, Bo was starting “to look a little down in the dumps.” But the president also revealed that with their daughters getting older, he and the First Lady were in a way preparing for their eventual moving out. “I think there is an element for Michelle and me of, you know, we see what’s coming and we need to make sure that we got somebody who greets us at the door when we get home,” Obama said. 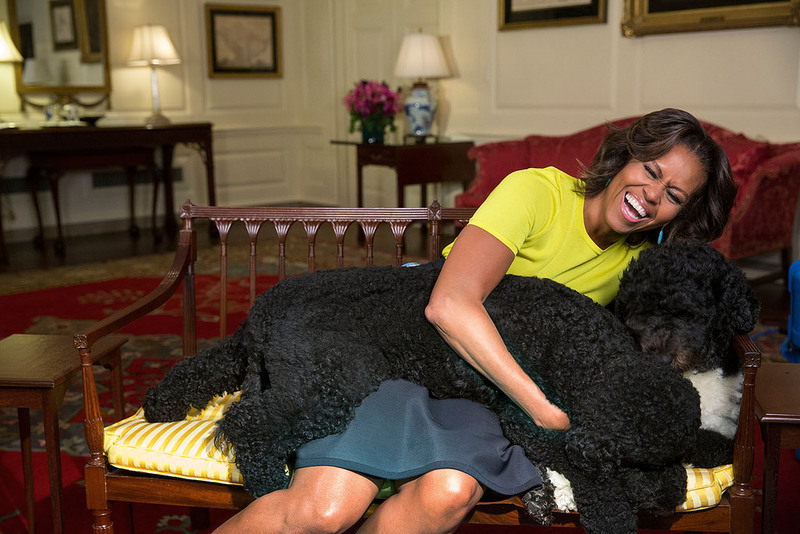 First Lady Michelle Obama hugs family pets Sunny (front), and Bo, April 14, 2014. Sunny may have earned her name due to her affectionate, happy nature, but she’s a bit more high-spirited than her big brother. “She’s faster… jumps higher, she’s friskier,” according to President Obama. Bo was trained by top-notch dog trainer Dawn Sylvia-Stasiewicz, who died in 2011. As a result, Sunny didn’t receive this intensive training and it shows in her spirited — and sometimes naughty — nature. While attending the 2013 White House Holiday Press Preview, Sunny was so exuberant that she accidentally knocked over 2-year-old Ashtyn Gardner, but her happy nature elicited an immediate apology in the form of a face licking for Ashtyn (who was not hurt). Like many dogs, Sunny also has the occasional accident. She has been known to sneak away from her people and soil the White House floors on occasion. 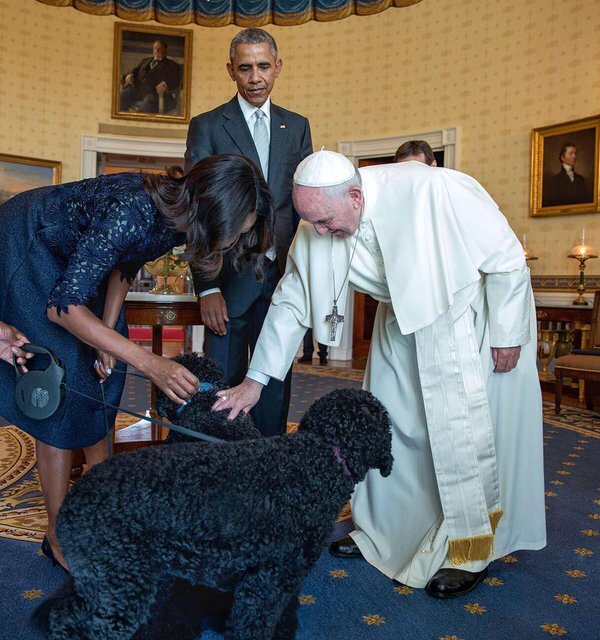 Pope Francis meets Sunny (front) and Bo in the Oval Office, Sept. 23, 2015. Sunny hasn’t met as many dignitaries as big brother Bo, but on one memorable occasion during a private meeting in the Oval Office she (and Bo) did meet the Pope. In early 2016, Bo and Sunny were the targets of an alleged dog-napping plot. Scott D. Stockert of Dickinson, North Dakota, was nabbed by Secret Service agents before he could follow through, according to officials, and both presidential dogs remained oblivious to the plot.